The music of The Paper Raincoat could easily begin to be described with the words once upon a time. . . Like opening the pages of a musical fairytale, their songs are rooted in the dreams and realities that flourish between the New York City concrete and a never-ending sky. It is a world simultaneously created and observed by duo Amber Rubarth and Alex Wong. Both already established on their own respective musical paths (Rubarth as a solo artist and Wong as a former member of the now-defunct band The Animators and who is currently working with Vienna Teng), the collaboration has been an organic one. "We started writing together before we knew that this was going to be a project. One day, we had a writing session and instead of writing songs, we came up with this whole idea for a story. We started jotting down all of this stuff about characters and then, we got the idea of doing a 'concept' band," explains Wong. Artistically affected by city they each now call home, Wong continues, "We both have had a lot of experiences since moving here to NYC and are pretty inspired by the place. Every time we sat down to write, the songs kept revolving around being here." However, the process of creating the songs that they offer to the world as The Paper Raincoat was a bit different than usual and has taken them on a journey where imagination leads the way. Instead of writing solely from first person experiences, they created storylines and peered into worlds of their characters, like gazing through a metaphorical looking glass and peppering their observations with the details from their own lives. "Everything is a combination of being autobiographical and observational. All of the songs on the EP resonate with us personally. The song Motion Sickness came from literally having vertigo. It's taking a concept and expanding it to apply to these characters," says Wong. With a dash of the wide-eyed innocence that many people experience upon meeting New York City for the first time, the song Sympathetic Vibrations, " tells the tale of a woman rewriting her own life story as a way of numbing the regrets of what might have been. "She tells the story of herself as a young girl coming to New York for the first time. It's trying to capture that utter amazement and excitement and also feeling like you've finally arrived somewhere that makes sense to you," says Wong. Rubarth further explains, "We were reading about sympathetic vibrations. There are vibrations that will resonate more than others. But if you have a tone that's not already in the room and it's not resonating, it actually blocks out others. We applied that idea to a city level. The bridge of the song is: the dissonance sounds right, the note you said was wrong. It's like if there is something you always thought was wrong about you, you finally find the place for it." 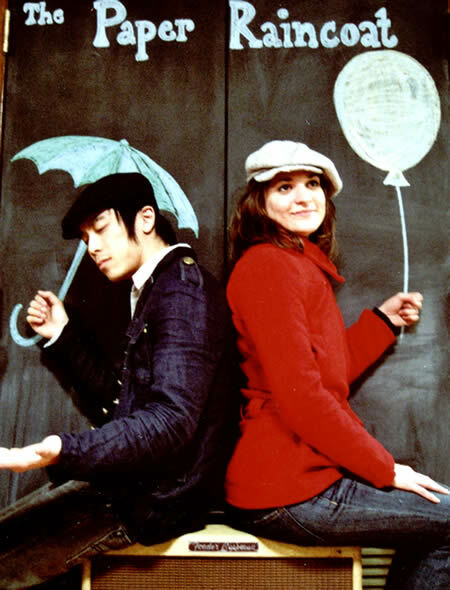 After celebrating the release of their EP in March 2008 at shows at the Canal Room in NYC and The Hotel Café in Los Angeles, The Paper Raincoat had a residency at Rockwood Music Hall. "Rockwood is like a home for The Paper Raincoat," enthuses Rubarth. "It feels like the venue fits the songs, like the venue itself could be in the songs." Their live shows bring this sense of wonder and whimsical optimism to life. "I think the live shows are quirky, too, with all of the different instruments and harmonies. It feels cinematic," she says before adding with a laugh, "but not in a goofy way." As they bring their music to other cities around the country, like recent shows in Boston and Memphis, Wong jokes that it's meals at Waffle House and Cracker Barrel that are the best parts of touring. That is, before he includes, "Even in the most remote places where I didn't expect there to be much going on, there's often the most going on because they have to create it there." Rubarth muses, "I like being able to step into different places and see the differences and also a lot of the similarity that exists everywhere. Especially since this is a made-up world, it's cool to apply it to different real cities and see how people interact with it." After all, sometimes, it's reality that can be the most interesting make-believe of all. . . The end. Interview originally appeared in IndieSoundsNY (Issue #31 April 2008).